This steel beam monorail runs from one end of Nagoya's popular Higashiyama Zoo and Botanical Gardens and back in a loop configuration. It serves as with a dual function of giving transportation from one end of the park grounds to the other, yet at the same time giving riders spectacular views of the popular destination . 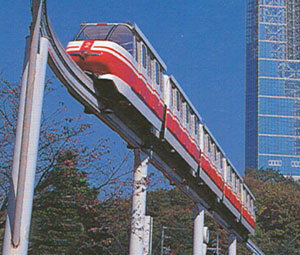 Before this steel straddle monorail was installed, Mitsubishi's prototype Safege monorail operated in the park from 1964 to 1974. It was the first revenue-producing Safege line in the world. The original Safege test track was in France. The Mitsubishi vehicle and a section of track have been preserved and are on display at Higashiyama.